Situated 2-3 hours’ drive north of Quebec City, Parc National du Fjord-du-Saguenay boasts one of the world’s longest and southernmost fjords, a rare sight along the Atlantic coast of North America. Here the Saguenay River, a prominent waterway flowing into the even larger Saint Lawrence, twists and weaves through a glacial valley, the result of a collapse 175 million years ago. 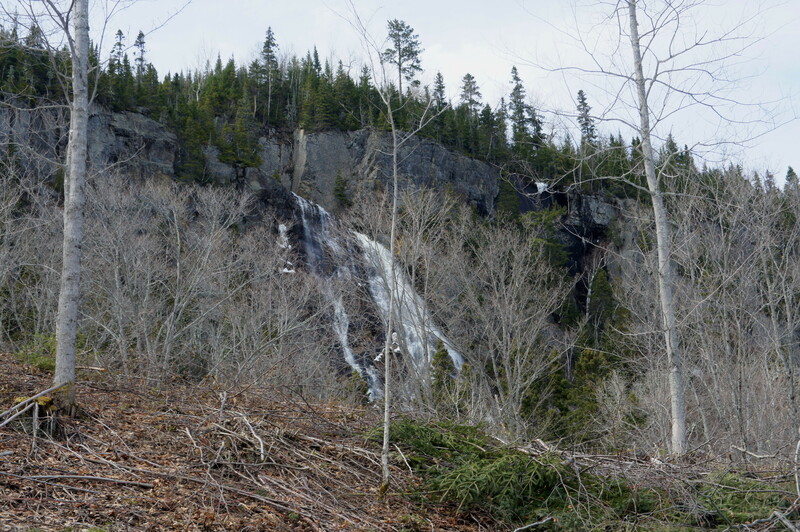 Sheer cliffs give rise to waterfalls of extraordinary height and frequency, including the Grosse Chute, the star of this hike in the L’Anse-Saint Jean area. 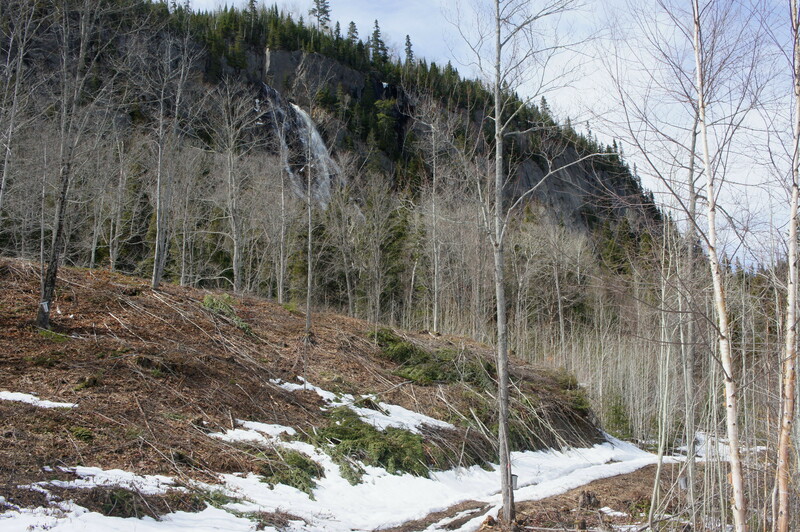 Sentier des Chutes—or Falls Path—is, in theory, one of the area’s best hikes—though here in the wild, scrubby north, it spends more than half the year buried in snow. 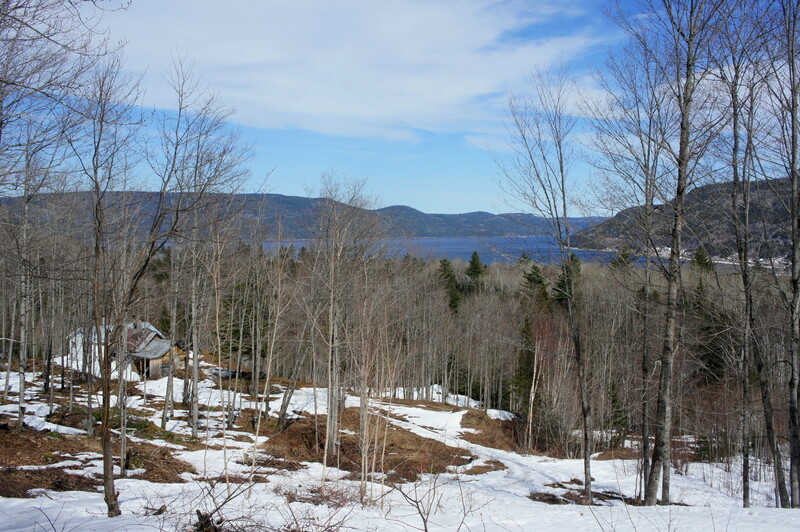 To reach the trailhead, bear north on Rue Saint-Jean-Baptiste into L’Anse-Saint-Jean for six kilometers (roughly 3.7 miles), then turn left onto Rue du Faubourg, which continues northeast along the banks of the creek. Turn left at the next junction, crossing the covered bridge. Turn left again after ½ mile, following the sign for “Sentier des Chutes.” This road—Chemin Saint-Thomas—provides access to the trailhead; look for a green sign on the right after about two minutes on the unpaved but well-maintained drive. 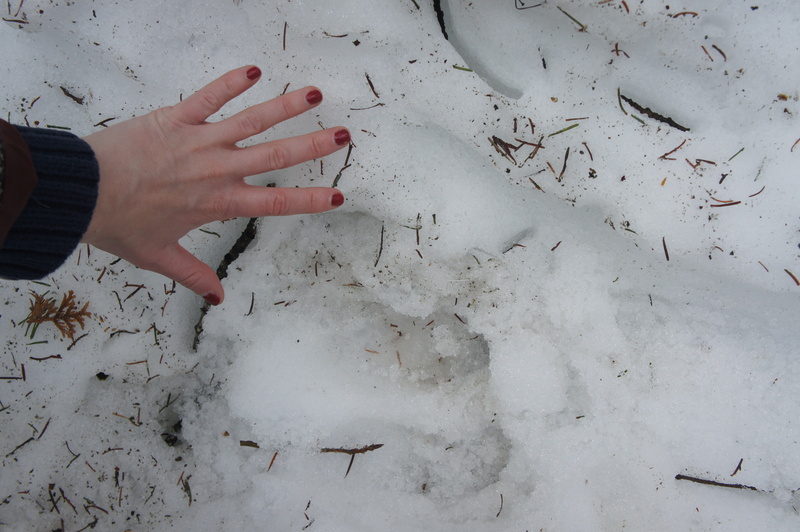 The trail begins amid a thicket of birches and occasional pines and bears northwest alongside a minor stream. A few minutes into the hike, the Sentier des Chutes begins to climb the first of several switchbacks. 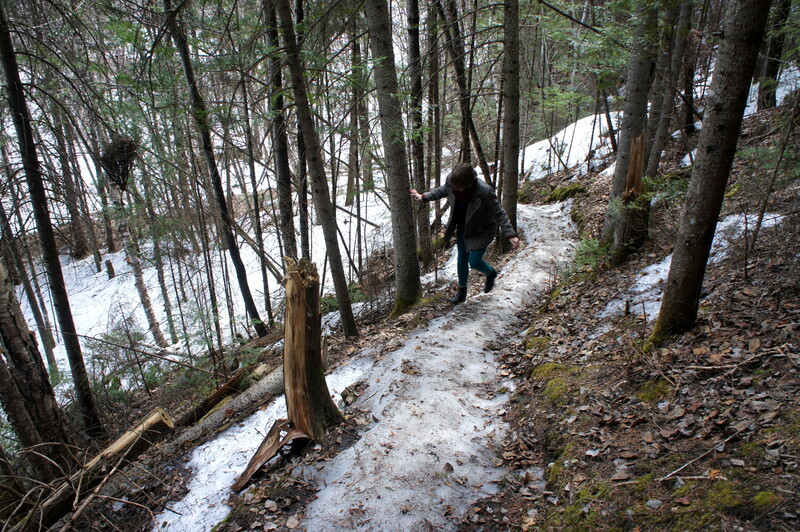 (Note: These were quite a challenge in the icy conditions) These first few switchbacks take care of most of the one-mile hike’s elevation gain, and the trail levels off after around 1/3 mile. 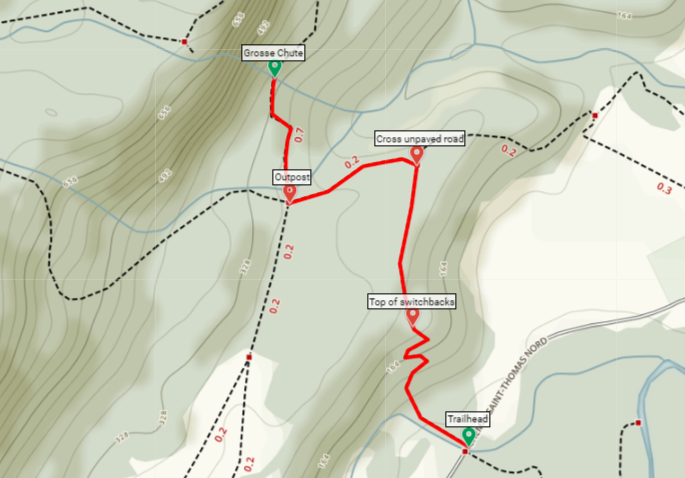 After a short respite, the climb resumes again at the “0.5 km” sign, and the trail approaches an unpaved road. Cross the road and continue westward, keeping the road in sight on the left while approaching the edge of a ravine on the right. Here the mighty falls pop in and out of view. Oh well, c’est la vie in Quebec. 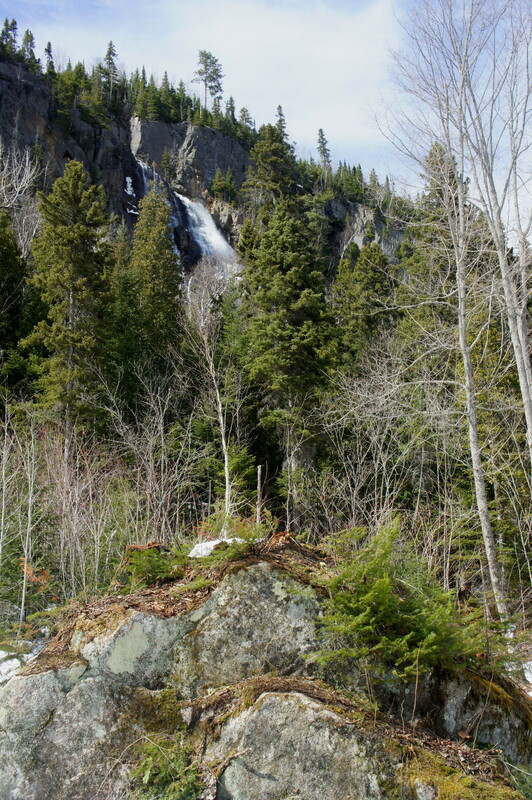 This entry was posted in Canada, International, Moderate Hikes, Quebec and tagged Canada, fjord, Fjord-du-Saguenay, L'Anse-Saint-Jean, Parc National du Fjord-du-Saguenay, Quebec, Saguenay, Sentier des Chutes, waterfall. Bookmark the permalink.